Twins Angelica and Agatha move to Alder Creek, hoping to find success in the west after the untimely deaths of both of their parents. Angelica is struck with a sudden illness and her sister is panicked that she’s going to lose her as well. Handsome and gentle Dr. Roger Sherman takes care of Angelica while she is ailing; visiting her every day to ensure that she is well again in no time. As she gets better, she begins to become interested in getting to know Dr. Sherman better as well. Is it possible that he might ever think of her as more than a patient in need of saving? Agatha has big ideas for what the sisters should do in town, but Angelica can’t keep focused on anything but her dashing former doctor. If they ever get married, will Agatha be able to handle the sudden separation from her twin and best friend? 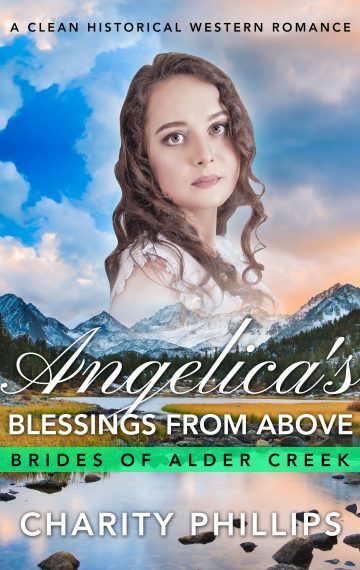 Angelica’s Blessings From Above is a standalone 20,000 word clean historical Western romance.